As tough as it might seem, there are ways to make numbers interesting enough to feature heavily in riveting dramas. JC Chandor’s ‘Margin Call’ proved this back in 2011 by taking something that could have been too dry and transforming it in to a gripping piece of cinema. 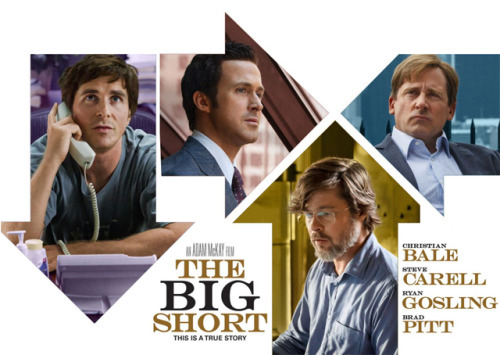 Adam McKay took on the same challenge with his adaptation of Michael Lewis’ eponymous non-fiction recounting of the financial crisis of 2007-8, and more particularly the popping of the housing bubble. McKay’s previous films, which feature the likes of ‘Talladega Nights’ and the ‘Anchorman’ franchise, focus largely on goofier humour and his regular partner in crime Will Ferrell, who up until this point had played a main role in all the films he directed, has always specialised at that. He has been successful in that realm of comedy, with ‘Anchorman’ becoming a huge hit that is still regularly quoted in pop culture, but you wouldn’t have associated him with films that go beyond that enjoyable but ultimately throwaway level, until now. It’s commendable that McKay would opt to do something so comparatively challenging as this, and he completely succeeds in making a film that’s adventurous, engaging and still contains morsels of that wit that had made his name up until now. Perhaps ‘breaking up’ with Ferrell (at least for now) is what it takes. The film manages reasonably well without him, featuring the likes of Christian Bale, Steve Carell, Ryan Gosling and Brad Pitt and also making sure that the likes of Jeremy Strong, John Magaro and Finn Whitlock get a lot to do. All the performances are brilliant, Carell in particular shining in his role as the irritable, outspoken, obnoxious and yet principled hedgefund manager Mark Baum, a character that suits him perfectly but who he manages to bring to life with plenty of verve. 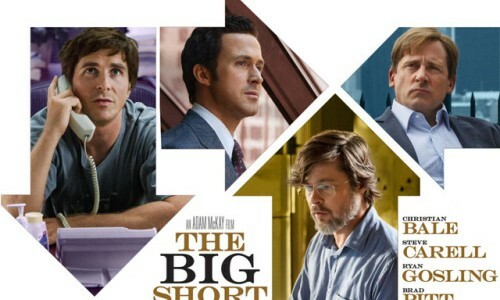 Bale has been nominated at the Academy Awards for his performance as Dr Michael Burry, a neurologist turned hedgefund manager who notices the bubble is going to burst and promptly bets against the housing market, to the increasing ire of his clients. Bale’s performance is one that balances restraint and excess very well, never becoming a caricature but getting across the eccentricities of his character in a way that never belittles him. We also get a smarmy performance from Gosling in his role as Jared Vennett, and a very understated performance from Brad Pitt, whose character gets involved with Magaro and Whitlock’s when they also realise the housing market is in major trouble. Sadly, a few of the other actors, the likes of Marisa Tomei for example, aren’t quite given enough to do, but what we do get is an ensemble of excellent performances that lay a foundation for the rest of the film. Aside from the performances, what makes the film stand out is the way McKay desides to portray it. It’s a smart, darkly comic film that isn’t afraid to break the fourth wall to explain acronyms and fine details to you, doing so often in amusing and innovative ways that help us both to get to know the characters and get a sense for what’s going on. Ryan Gosling’s Jared takes us through the story, often addressing us directly as he narrates events and pauses to comment on the morality of betting against the system and how he, frankly, doesn’t care. We also get cameo appearances from the likes of Margot Robbie, Selena Gomez and Anthony Bourdain, all of whom appear as themselves to explain to us the key aspects of what is going on, and just what those technical terms mean for the situation the characters find themselves in. This docu-drama strategy is one that could easily have backfired and taken us out of the story and in to wordy explanations too often for us to really attach ourselves to the action, but McKay makes sure it doesn’t with humour and a good sense of just where we might need some touching up on proceedings. It does, however, take a little while to get in to the structure of the film, and you have to allow the film time to convince you of its method before you completely go along with it. This could be a criticism, or it could just be a mark of the fact that McKay’s way of presenting the story is so different from what we’re used to, but it’s easy to see the style not working for some people who may end up finding it patronising or alienating. For us, that problem never really arose, so what we’re left with is a film that’s not afraid to try adventurous things and manages to tell the story in an accessible and emotionally engaging way, to asking us questions about the morality of events and tying us in knots about whether we should really be rooting for the characters at all. The film is nominated for best picture and best director at the upcoming Oscars and BAFTAs, and would be a worthy winner in both categories, proving just what McKay has in his locker when he’s prepared to get in to the nitty gritty of a topic, and this is one he obviously cares deeply about.